Monica was able to walk right down the middle of Main Street USA...every day! 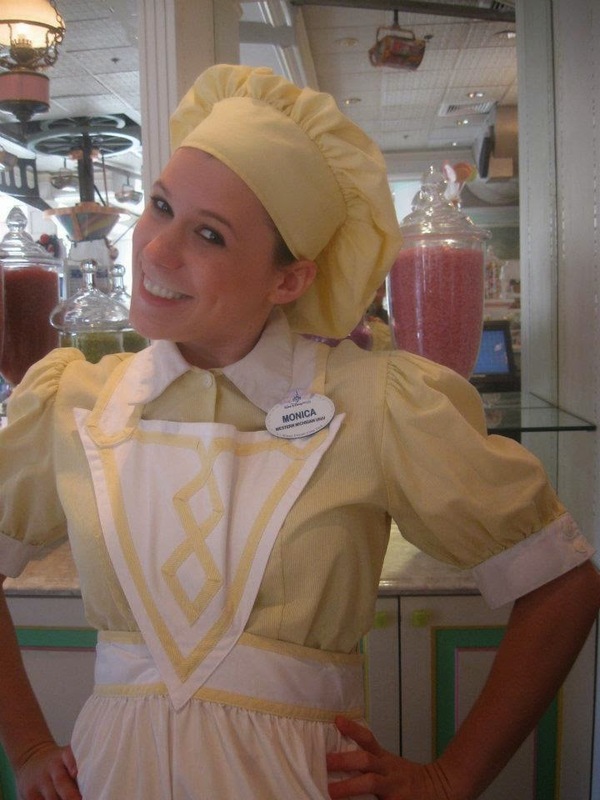 Here's what she had to say about her experience working in merchandise in Magic Kingdom! 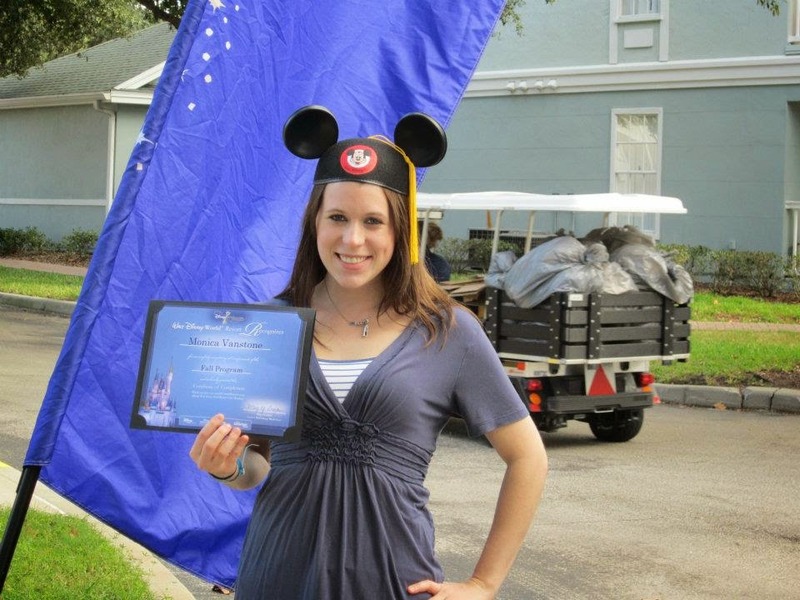 I worked in a merchandising role on Main Street East at the Magic Kingdom at Walt Disney World. Main Street East is the opposite side from The Emporium. 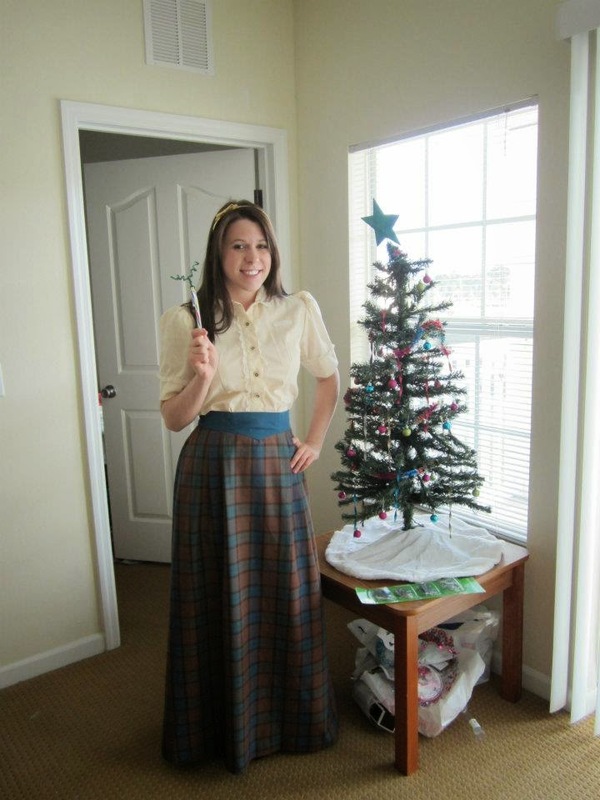 I worked in stores such as The Confectionery, Uptown Jewelers, Main Street Cinema, and Town Square Theatre. First thing, I checked my schedule to see what costume I needed, as The Confectionery costume is different from all other Main Street East costumes. If I was working in the Confectionery, once I clocked in and received an assignment, I was generally in that position until one of my breaks. However, if I was not working in the Confectionery, my location and tasks could change every half an hour. Generally, I would help guests complete their purchases at the different stores, assist in watch sizing, customize hats in the Chapeau (my favorite), or working the outdoor carts (my least favorite). I was pretty open to accepting a number of different roles. I had ranked Merchandise, PhotoPass, Character Attendent, and Attractions in my top four choices. During my phone interview, it became pretty obvious that I was going to be placed in a merchandise role because all the interviewer wanted to talk about was my previous retail experience (I had quite a bit). I was happy about my position - although it would have been nice to learn something new. My favorite parts of my job were interacting with guests and my fellow CPs. Making magical moments for Guests is something that I will never forget. My favorite job was to personalize Mickey ear hats at the Chapeau. I really liked working with the sewing machines and putting my own touch on things. My least favorite parts of my job were the long hours. The Magic Kingdom often has extra magic hours late into the night, and as a CP, you are first in line to fill those shifts. However, that said, one of my best memories is standing on Main Street with a group of CPs looking at Cinderella Castle at about 3:30am, when all the guests had left and the park was closed. I also really didn't like taking the Confectionery trash out to the dumpster - it smelled really bad back there! I was lucky enough to be a part of so many magical moments during my CP. One that really stands out to me, was a couple celebrating their 40th anniversary. The Magic Kingdom was also celebrating it's 40th anniversary, and the couple had saved for a several years to be able to spend their in Disney. I was working in Townsquare Theatre as the Photopass check out and it was a slow night. I got to chatting with a Photopass photographer and we both noticed the couple, sitting and waiting for their dinner reservation at Tony's restaurant. We went over to them and started talking to them. They were the nicest couple! We ended up getting on the phone with our supervisors and we got the green light to pretty much do whatever we could to make their trip special. We were able to give them Mickey and Minnie 40th Anniversary plush dolls, a large customized Mickey Rice Crispie treat, Bride and Groom ear hats with their names on it, and the photopass photographer took so many pictures of them, and gifted them all the pictures that they chose as their favorites. What was really sweet was one of the pictures they chose was one where they were posing with me in between them. They said it was their favorite and that they would always remember what I had done for them. It was so sweet! I have always loved Disney World and have always wanted to be a part of the magic in some way. Their was a presentation at my campus that I attended, and after that, I was obsessed with the idea and couldn't wait to apply! I wish I would have known how much work it would actually be. You are working a full time job. 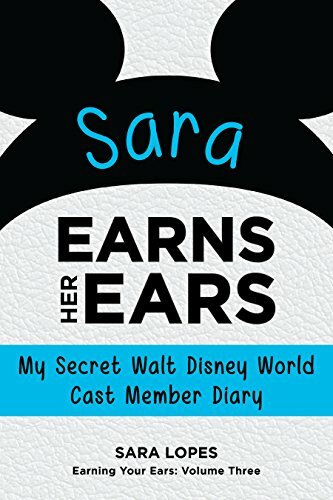 I had done this before, but just know going in that just because you are at the happiest place on earth it doesn't mean you won't have bad days, cranky guests, and sore feet. Also, I wish I would have known how fast it was going to go by! There are so many things that I kept pushing off to do "the next time" and before I knew it, it was January and time to go home. Have fun! Interact with guests as much as you can. Never be afraid to ask questions and to learn more about your position.